Love banana bread but hate the wait? Then these pancakes, made from banana bread batter, are for you. The batter has less sugar and is a tad thinner than quick bread batter — that’s just so the pancakes cook up quickly, but don’t scorch, plus they’re ready in no time. Sprinkle a few banana slices and toasted pecans on your stack of banana bread pancakes, then drizzle on the delicious bananas foster syrup for a breakfast that’s sure to sweeten your morning. Balance their sweetness by serving them with sausage or bacon. Whisk together flour, baking soda, and salt in a large bowl. In a separate bowl, whisk together the mashed bananas, buttermilk, sugar, butter, egg, and vanilla. Add wet mixture to dry mixture; stir just until combined. Heat an electric griddle to 375° or a nonstick skillet over medium-lo; coat with nonstick spray. Drop batter by 2 Tbsp. onto griddle and cook until bubbles appear and bottoms are brown, 4 minutes. Flip pancakes and cook until brown, 2 minutes more. 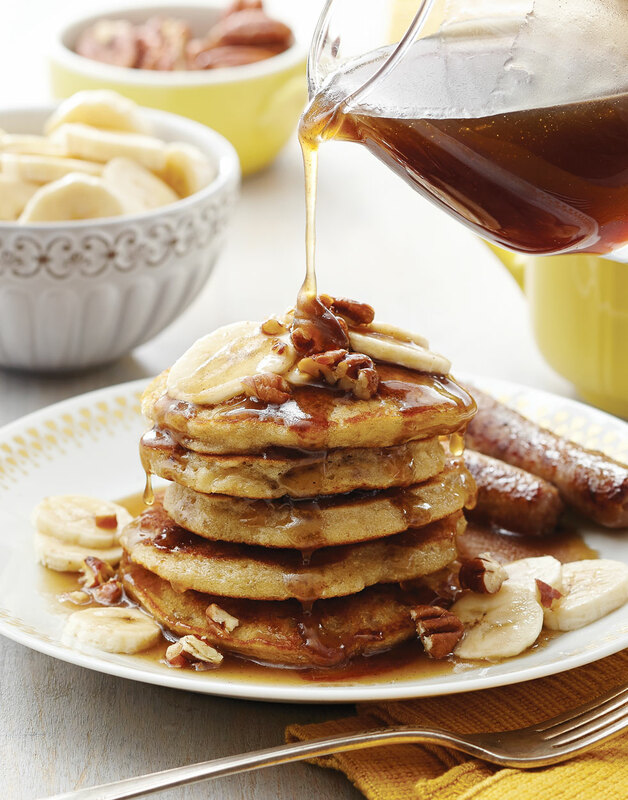 Serve pancakes with Bananas Foster Syrup, sliced bananas, and pecans. The riper the bananas are, the more flavor they'll provide. Mash them until very smooth. Once the bubbles begin to break on the pancake tops and their bottoms are browned, flip them.